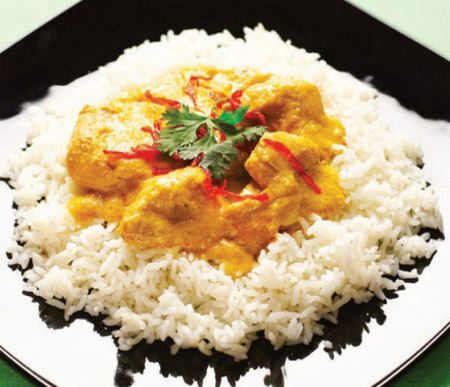 A classic Indian Chicken dish, once you know how to cook a chicken korma, you've pretty much got Indian cooking under your belt. And with this simple recipe, that really is not going to be difficult! This recipe serves four and take about 25 minutes to prepare and cook. In some oil, fry the onion and garlic in a large pan untill the onions are brown. Add the salt, cumin, chilli powder, and crushed cardomon seeds and cook for another few minutes. Ensure that the mixture is stirred well. Chop the chicken into bite sized bits and add to the pan along with the other spices. Fry for another few minutes stirring constantly. Add half a cup of water, a bay leaf and the yoghurt and simmer gently untill the chicken is cooked. Serve with a sprig of frsh corinader on the top and some Indian bread or rice.